Winter always reminds me of snow, winter coats and birds flying south. So I combined these items to make my winter themed arch. I used Distress crackle paint to make the background. This gave the piece a feeling of cracked ice. Winter has always been a magical time for me. I have so many memories of waking up on winter mornings with snow on the ground. Oh what a great joy if school was cancelled for the day. I would get to go outside to play in the beautiful white snow drifts. I remember being so cold that my fingers and toes were numb but not caring. It sure would have been nice to have a muff for my hands on those cold days. Now I get to enjoy those snow days with my daughter. It is so great to see her excitement as she plays in the snow. See my blog at www.paperflowers1.blogspot.com for more information on how I made this piece. What do you think of when the term “winter” is used? Snow gently falling? Children building snowmen? Old fashioned ladies bundled in their coats with fur muffs? Whatever comes to your mind we would love to see if here in gothic arch form. Our hostess is Cora Harkins who made this gorgeous arch for this weeks challenge. Cora has a beautiful blog (which happens to have some winter images freebies today) where you can see more of her artwork! Bio: I am married with one daughter. I work full time as a salesperson and stamping is my artistic outlet. My degree is in costume and set design. Though I do not design professionally, I try to bring that training into my art work. 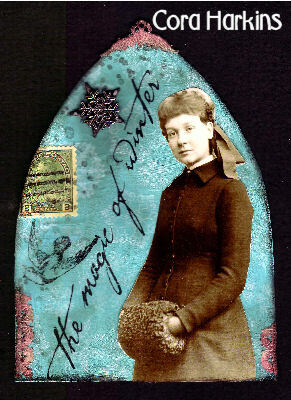 I love antique lace, buttons and ephemera. You can often see me lurking at area flea markets trying to find new treasures. I teach classes and sell my cards locally. I have been stamping and card making for over 15 years. One of my first projects was my wedding invitations. Lucky for me we had a small wedding. Here is my arch for this week. Thanks for looking. I love winter! Wonderful theme! Lovely theme — snow is falling outside, too! This is my first time playing here. I’m just crazy about arches! Thanks to all for such wonderful inspiration and eye candy! Here is my Winter Arch for this week’s challenge. Oops!!!! didn’t post my link right! Sorry…here it is..
There’s no winter in France but, so I was so happy to illustrate this theme. Our weather lately certainly helped inspire me to do this one! thank you for this beautiful challenge ! here is my Winter Arch. TFL. Waouh!!! not the last this week!!! first time!!! lol !! !